Leaves palmately five to eleven-lobed or parted, erect or nearly so, from a thick, usually oblique, simple or branched rootstock, the leaf segments variously toothed or cleft, the middle segment usually the widest, more or less villous beneath, especially on the veins and on the petioles, the upper surface of the leaves often smooth; early leaves smaller and usually less divided than the later ones. Flowers on stalks about as long as the leaves, two-thirds to 1 inch broad, violet-purple; sepals blunt; cleistogamous flowers on prostrate peduncles; seeds brown. In woods and thickets, rarely in open fields and most abundant in rather dry, rich soil on wooded hills, Massachusetts to Minnesota, south to Florida. Flowering from April to June. 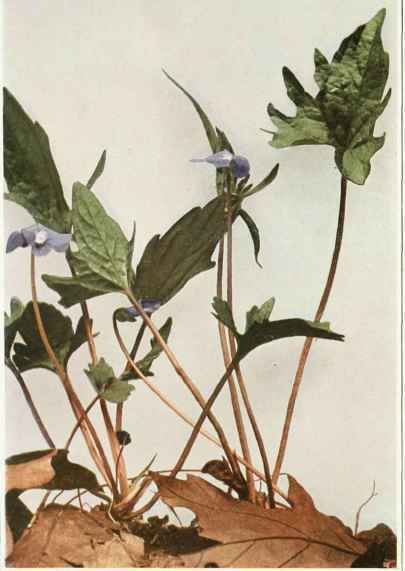 Like several of the other blue-flowered violets it is locally known as Johnny-jump-up. Among its close relatives in the east is Viola triloba Schweinitz, in which the earliest leaves and those put forth in late summer are usually with uncut, reniform, cordate blades, the summer leaf blades 4 to 6 inches wide, densely villous beneath and on the petioles, three-lobed or three-parted. Viola perpensa Greene, of the Great Lakes region, possesses linear, acuminate lateral leaf lobes.